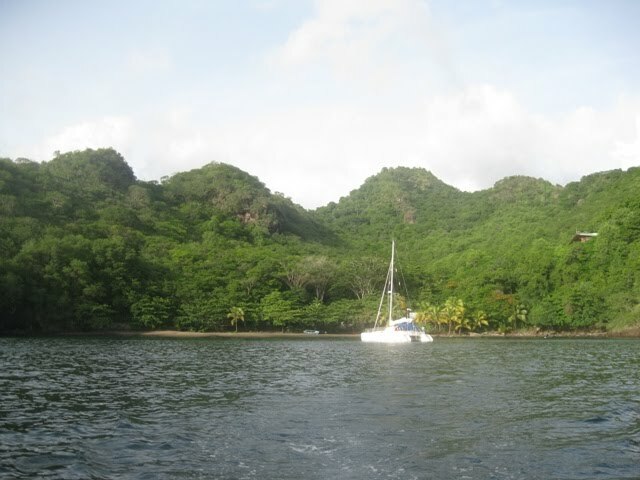 One of the highlights – if not the biggest one – in The Caribbean is SVG or St. Vincent and The Grenadines. This is how the country is officially called, but most sailors skip the first part of the name (for safety reasons) and only care about The Grenadines, an area south of “the mainland”, scattered with tropical, lush islands adorned with lovely white sand beaches, friendly locals and little land tourism. 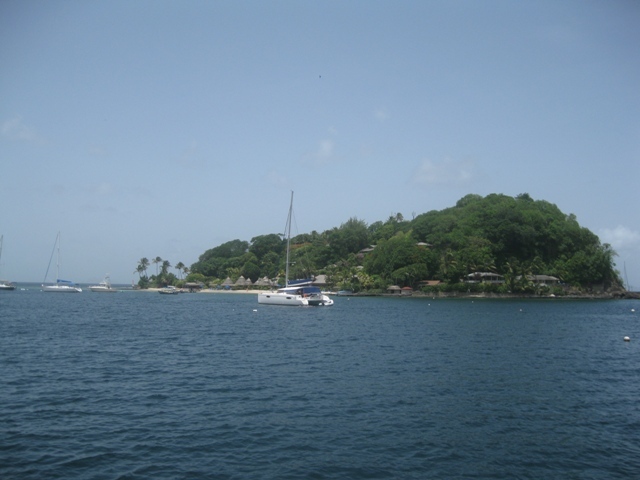 The Grenadines portray the typical image of what one has in mind when thinking “Caribbean”. Irie has passed SVG before. Twice. Each time thinking “Man, I wish we could stop and enjoy some time in the islands”, followed by an accusing look at Darwin. Not that it is his fault that the rules to land a pet here are so complicated and full of hassle. 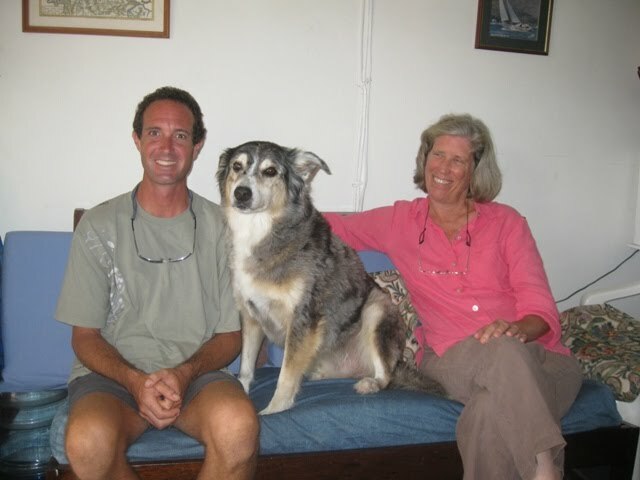 But, visiting with a dog is not impossible, so this time around, we made it a priority to play by the rules, plan ahead and explore The Grenadines. Our main reason to stop in Martinique after Dominica was to obtain a health certificate for Darwin. That proved easy enough, but getting in touch with the SVG Agriculture Department about our arrival date and paperwork failed enormously for four weeks. Emails – with the dog’s documents and permit application attached- remained unanswered; the internet connection was never good enough to Skype. Finally we managed to maintain a decent phone connection with the department, only to hear that a health certificate from Martinique was unacceptable! Irie was required to stop in St. Lucia to obtain an export health certificate. 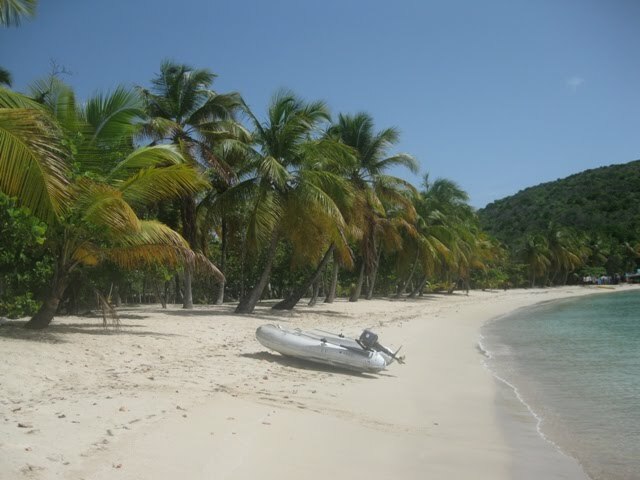 If only we would have known that ahead of time, we could have saved money and hassle, but our email questions remained unanswered… At this point, Mark had had enough of all the rules and difficulties and was ready to skip The Grenadines for once and forever. Since it would be one of our highlights and our only planned “vacation”, I was stubborn and determined. From that moment, Darwin became my responsibility. I checked us and the dog into St. Lucia, which took a whole day, paid all the fees and managed to hitch rides with Darwin in the blazing sun to the Agriculture Department of St. Lucia, where an export health certificate was issued… After a week of all kind of chores and social gatherings (The World Cup had started), I checked us out. The battle was almost over. Our next step was a stop in Young Island Cut, on the south coast of St. Vincent, the only place a government vet could inspect the animal. We wanted to get there early to be able to continue our journey to The Grenadines the same day, so spent our first SVG night in a small bay called Byahaut not far from Darwin’s check-in point. This bay was wonderfully quiet, in a tropical setting, with jungle behind the black beach and a pretty coral garden under the water surface. Once in Young Island Cut, we needed to pick up a mooring (and pay after bargaining down, since we only planned to stop for an hour) and call the government vet through a helpful local. After more than an hour of waiting, the apologizing, friendly vet showed up, inspected Darwin and his paperwork and issued us a pet permit for three months. Phew! 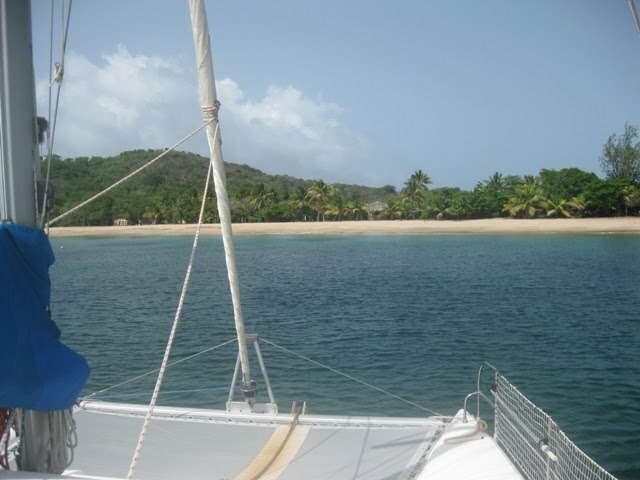 Now we could continue on to Bequia, the first of The Grenadines, to check ourselves in –and pay- for one month. Finally arrived! We joined our friends from Alianna, Imagine, Tatia, Maegus and Ubuntu in Admiralty Bay and enjoyed long walks on the nice beach, refreshing dips in the green water, a stroll in town (where, every five minutes somebody hassled us for having the dog onshore, but we could prove his legitimacy), social evenings and an interesting meeting with Sally, the editor of Caribbean Compass (www.caribbeancompass.com), a popular and professional sailing newspaper for which I’ve written. Friendship Bay around the corner didn’t do much for us. 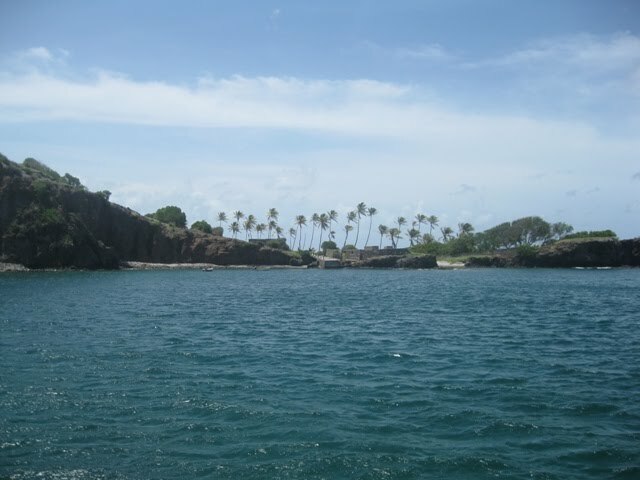 The cloudiness of the water provided no visibility for snorkeling, or even checking the anchor, and the crashing waves made landing Darwin challenging. On the way to Canouan, the next “big land mass”, we briefly stopped at Petit Nevis for an island exploration and a snorkel around the rocks. This is a very picturesque day stop, as long as the incoming swell is bearable. 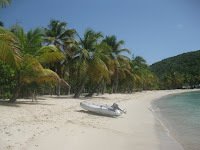 On Canouan, the atmosphere is very laid-back and people are friendly. 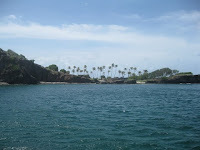 Mark, Darwin and I managed an early, but already hot, morning walk to Twin Bay on the windward side of the island. Along the way we saw small tortoises and fended off aggressive stray dogs. The small, colorful town was filled with goats and chickens. 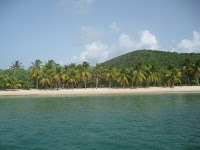 From the moment we read about the small island of Mayreau, we wanted to go there immediately. Hence the short stay in Canouan. Our first stop was Saltwhistle Bay, with its palm trees and white sand, one of the prettiest, most tropical and exotic bays we’ve ever seen. To use the cliché: it was a picture perfect postcard image. We hoped to spend a few lazing days here (there is no internet, yeah! ), but the presence of six sport fish boats, all with close to fifteen people on it (mostly kids) and tied to shore, occupying a third of the bay, made us leave earlier than planned. Not that we mind sharing a beautiful place, but the noise, chaos and swell created by dinghy driving and wakeboarding kids all day was a bit too annoying. Add to that a bunch of charter boats anchored on top of us and the peace was completely absent. The perfect anchorage doesn’t exist! 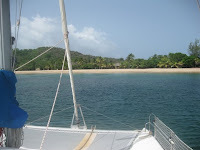 So, we ended up in Saline Bay, a big, comfortable harbor on the southwest side of Mayreau, to sit out stormy weather and hang out with all our friends just a bit more. The beach here is also very attractive with palm trees providing shade and yellow sand providing walks for Darwin. The village, so small that it doesn’t have a name, is close by and houses the few inhabitants. The whole island, only one mile or so long, has one road (less than a mile), a handful of cars, wagging strays (Darwin made lots of friends) and friendly people, and perfectly suits our humble needs. Next: Tobago Cays for some relaxation and snorkeling!